After leisurely stepping off the tallest man-made structure in the Southern Hemisphere earlier in the day I decided do something else that I would get the adrenaline flowing: bungy jumping. 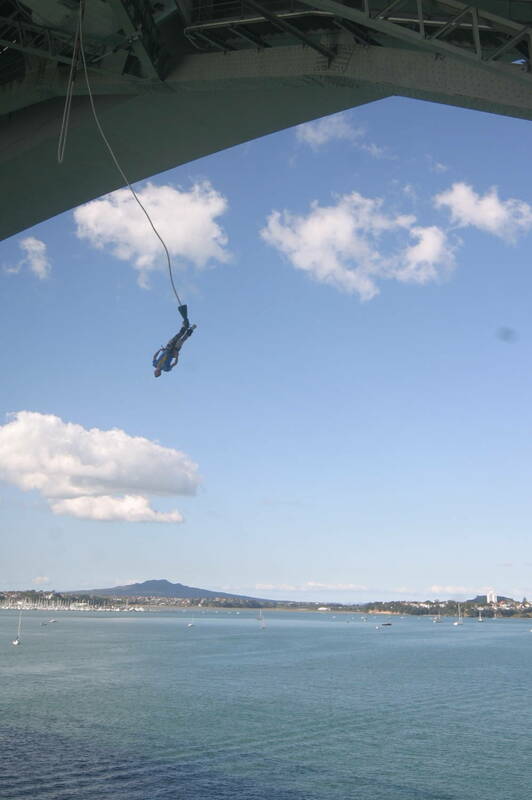 At this point in my life I had only dreamed of doing such a thing – I hadn’t even been sky diving yet – and I knew that before I left New Zealand that I would have to bungy. 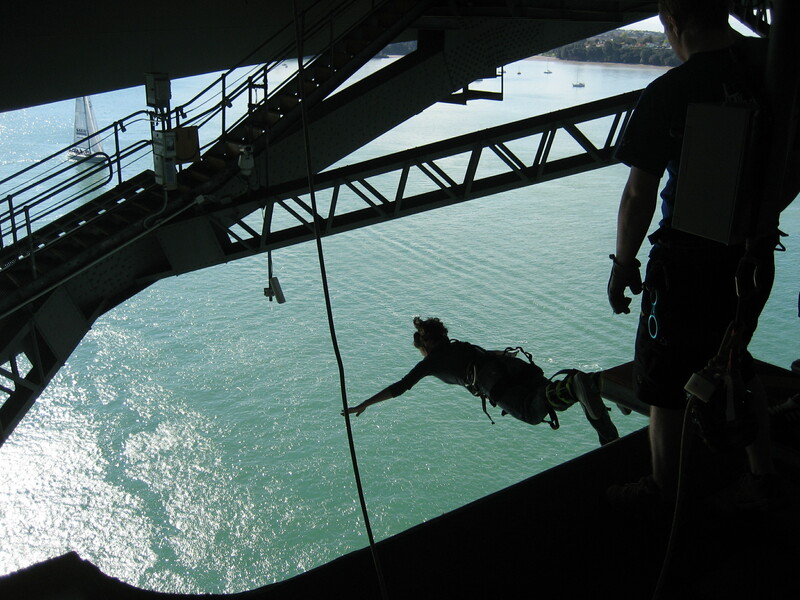 I remembered, from by brief chat with the Sky Jump employee atop the Sky Tower, that the Auckland Harbour Bridge had a bungy platform. After my jump, I went back to my room to drop off a few things and to pick up a map. I gave it a slight glance over and then decided that all I needed to do was follow the road that led to the bridge. I left the map in my room, grabbed my camera and jacket and began my trek. 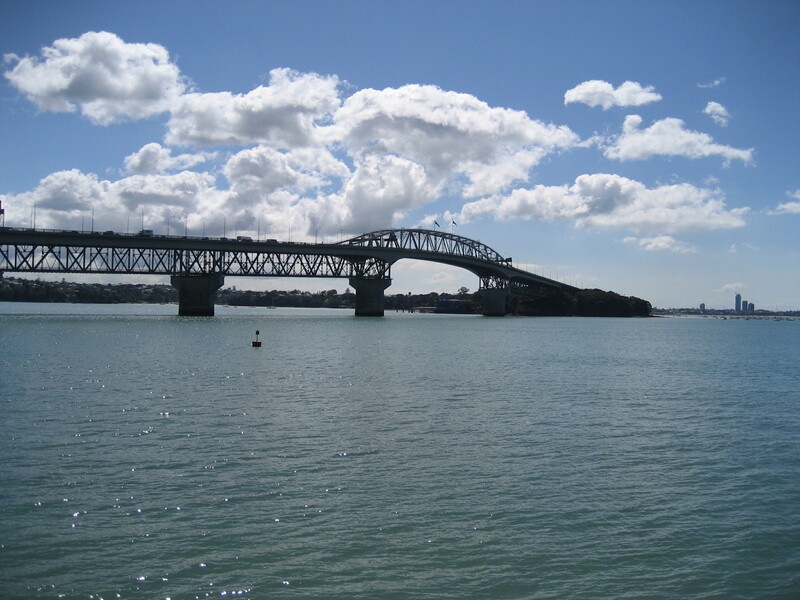 About 40 minutes later, I arrived at the Auckland Harbour Bridge. From that shot you can’t even tell that there’s a bungy platform. It looks like a very normal bridge…that people jump off. After watching an informational/safety video and being strapped into my harness, it was time to walk out. It was a very easy walk that wasn’t painful at all. Looking down at the blue water was rather relaxing and, in all honesty, the drop didn’t look that daunting from there. 40m didn’t look that bad at all. Didn’t being the operative word. That was until I started watching the other people in my group jump and I stuck my neck over the ledge and saw the water below. Yeah…it was further than I thought. 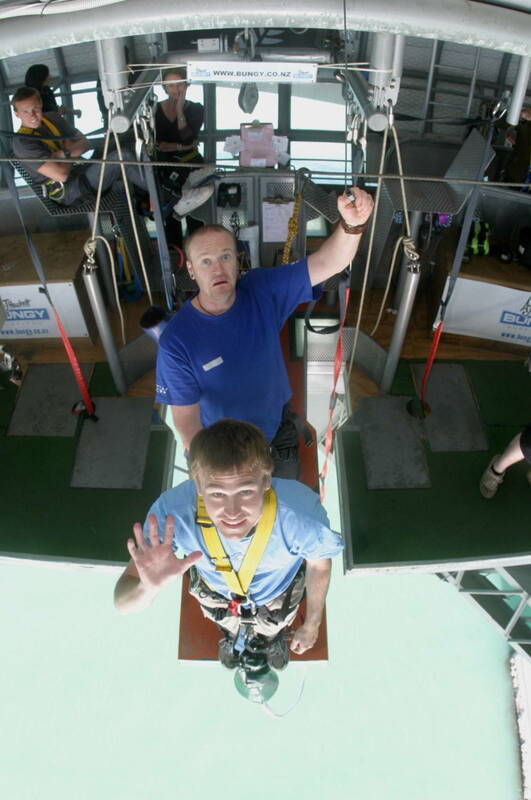 When it was my turn, I sat in a chair and laughed nervously as they strapped my feet in and checked my weight with that of the corresponding bungy tether. That’s when a strange question was asked. “Do you wanna get wet mate?” He asked with a pleasant Kiwi accent. I paused. I thought that this may be the only time I am ever going to be in Auckland so I better go big or go home. Next thing I know, I’m inching my way to the lip of the platform and the instructor is telling me to keep my arms atop my head like I’m diving because it will make an easier transition into the water. AKA my head won’t slap the water on impact. They began to count down and once they got to two I stopped them, took a deep breath and then told them to start it up again. The countdown continued and once they got to one they yelled “BUNGY!” and I jumped. My hands were above my head, my eyes transfixed on the water below getting closer and closer, the wind whirred by my ears and then SPLASH! The icy cold glacier-runoff water that was the Auckland Harbour completely surrounded me and then I shot out just as soon as I got in. I didn’t end up going in chest deep. I went in thigh deep.